The Ludi Bin: Why does Bravely Default need freemium crap? Why does Bravely Default need freemium crap? Bravely Default is the "old-school inspired" JRPG that everyone is playing on their 3DSs. The game has a very traditional storyline and a job system that harkens back to early Final Fantasy games. One of your characters has his village destroyed by the evil forces you need to stop. Unlike traditional JRPGs, Bravely Default has you rebuilding the village with freemium-type techniques. How it works: Each day you can get more villagers from street/netpass (either passing by people in real life or online). You use these villagers to rebuild and upgrade buildings like an armor shop or accessory shop in a menu separate from the overworld. 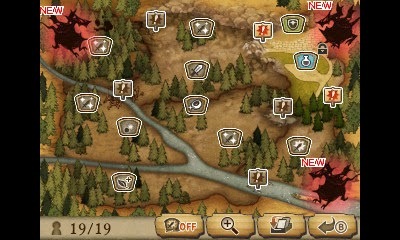 These shops can be accessed in-game in towns and before bosses. High-level upgrades take a lot longer, but if you put multiple villagers on one project it won't take as long. Oh, and time only passes if you are playing the game or have it suspended in sleep mode on your 3DS. This is basically due to the limitations of the 3DS system, which only allow one thing running in the background at a time, but I think this is the reason they have this here at all. If you're playing Bravely Default and you want to rebuild the town, your best bet is to swear fidelity to the game and always have it in sleep mode. You could play a different game on your 3DS, but right afterwards, you'd want to switch to the game so the timers on your upgrades can keep clicking down. In other words, it gets you coming back to the game; it's "sticky." But why does Bravely Default need to use these tactics? I've already given them my $40, why do they care whether or not I finish the game? The designers here are in it for the long haul. When you have a game in sleep mode, it shows up for people you streetpass as the game you're currently playing (free exposure). If you're constantly playing the game, you're more likely to talk about it (more free marketing) and maybe even finish it. Since it's the first in a series of games, it's in their best interest to get to you beat this really long game so in a year or two you'll want to buy the sequel. Of course, that's just my armchair analysis. I'd love it if developers would talk about the data behind freemium techniques like city building and how it affects player attrition and marketing.